Before you get started, take this readiness quiz. If you missed this problem, review [link]. Simplify: ⓐ \(9^2\) ⓑ \((−9)^2\) ⓒ \(−9^2\). We are ready to perform operations on polynomials. Since monomials are algebraic expressions, we can use the properties of exponents to multiply monomials. Multiplying a polynomial by a monomial is really just applying the Distributive Property. Just like there are different ways to represent multiplication of numbers, there are several methods that can be used to multiply a binomial times a binomial. We will start by using the Distributive Property. We abbreviate “First, Outer, Inner, Last” as FOIL. The letters stand for ‘First, Outer, Inner, Last’. We use this as another method of multiplying binomials. The word FOIL is easy to remember and ensures we find all four products. Let’s multiply \((x+3)(x+7)\) using both methods. We summarize the steps of the FOIL method below. The FOIL method only applies to multiplying binomials, not other polynomials! DEFINITION: USE THE FOIL METHOD TO MULTIPLY TWO BINOMIALS. When you multiply by the FOIL method, drawing the lines will help your brain focus on the pattern and make it easier to apply. Now we will do an example where we use the FOIL pattern to multiply two binomials. 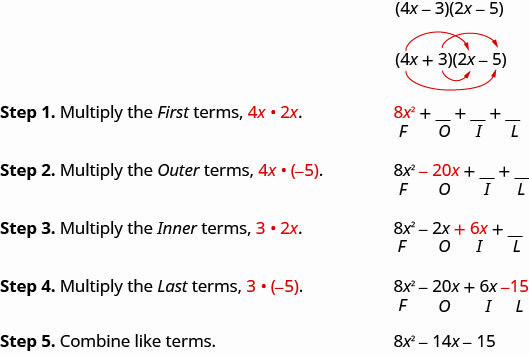 The final products in the last example were trinomials because we could combine the two middle terms. This is not always the case. Step 1. Multiply the First terms. Step 2. Multiply the Outer terms. Step 3. Multiply the Inner terms. Step 4. Multiply the Last terms. Step 5. Combine like terms—there are none. Step 5. Combine like terms. The FOIL method is usually the quickest method for multiplying two binomials, but it only works for binomials. You can use the Distributive Property to find the product of any two polynomials. Another method that works for all polynomials is the Vertical Method. It is very much like the method you use to multiply whole numbers. Look carefully at this example of multiplying two-digit numbers. Now we’ll apply this same method to multiply two binomials. Multiply using the Vertical Method: \((3y−1)(2y−6)\). It does not matter which binomial goes on the top. Notice the partial products are the same as the terms in the FOIL method. Multiply using the Vertical Method: \((5m−7)(3m−6)\). Multiply using the Vertical Method: \((6b−5)(7b−3)\). We have now used three methods for multiplying binomials. Be sure to practice each method, and try to decide which one you prefer. The methods are listed here all together, to help you remember them. We have multiplied monomials by monomials, monomials by polynomials, and binomials by binomials. Now we’re ready to multiply a polynomial by a polynomial. Remember, FOIL will not work in this case, but we can use either the Distributive Property or the Vertical Method. Multiply \((b+3)(2b^2−5b+8)\) using ⓐ the Distributive Property and ⓑ the Vertical Method. ⓑ It is easier to put the polynomial with fewer terms on the bottom because we get fewer partial products this way. Multiply \((y−3)(y^2−5y+2)\) using ⓐ the Distributive Property and ⓑ the Vertical Method. Multiply \((x+4)(2x^2−3x+5)\) using ⓐ the Distributive Property and ⓑ The Vertical Method. We have now seen two methods you can use to multiply a polynomial by a polynomial. After you practice each method, you’ll probably find you prefer one way over the other. We list both methods are listed here, for easy reference. Mathematicians like to look for patterns that will make their work easier. A good example of this is squaring binomials. While you can always get the product by writing the binomial twice and multiplying them, there is less work to do if you learn to use a pattern. Let’s start by looking at three examples and look for a pattern. Look at these results. Do you see any patterns? What about the number of terms? In each example we squared a binomial and the result was a trinomial. Now look at the first term in each result. Where did it come from? The first term is the product of the first terms of each binomial. Since the binomials are identical, it is just the square of the first term! To get the first term of the product, square the first term. Where did the last term come from? Look at the examples and find the pattern. The last term is the product of the last terms, which is the square of the last term. To get the last term of the product, square the last term. Finally, look at the middle term. Notice it came from adding the “outer” and the “inner” terms—which are both the same! So the middle term is double the product of the two terms of the binomial. To get the middle term of the product, multiply the terms and double their product. To square a binomial, square the first term, square the last term, double their product. Multiply: ⓐ \((x+5)^2\) ⓑ \((2x−3y)^2\). Multiply: ⓐ \((y+11)^2\) ⓑ \((4x−5y)^2\). We just saw a pattern for squaring binomials that we can use to make multiplying some binomials easier. Similarly, there is a pattern for another product of binomials. But before we get to it, we need to introduce some vocabulary. 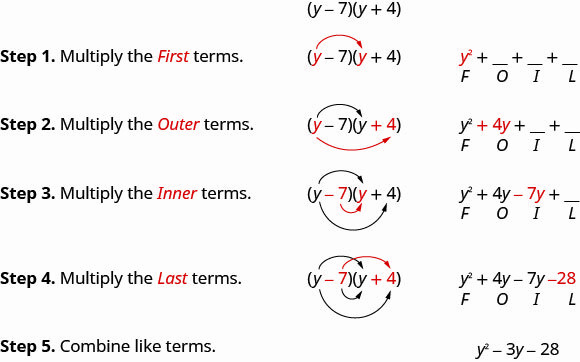 A pair of binomials that each have the same first term and the same last term, but one is a sum and one is a difference is called a conjugate pair and is of the form \((a−b)\), \((a+b)\). The pair of binomials each have the same first term and the same last term, but one binomial is a sum and the other is a difference. There is a nice pattern for finding the product of conjugates. You could, of course, simply FOIL to get the product, but using the pattern makes your work easier. Let’s look for the pattern by using FOIL to multiply some conjugate pairs. What do you observe about the products? The product of the two binomials is also a binomial! 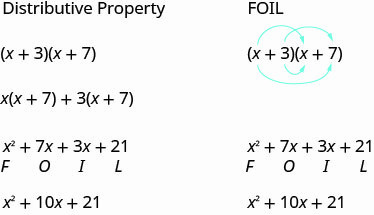 Most of the products resulting from FOIL have been trinomials. Each first term is the product of the first terms of the binomials, and since they are identical it is the square of the first term. To get the first term, square the first term. The last term came from multiplying the last terms, the square of the last term. To get the last term, square the last term. Why is there no middle term? Notice the two middle terms you get from FOIL combine to 0 in every case, the result of one addition and one subtraction. The product of conjugates is always of the form \(a^2−b^2\). This is called a difference of squares. The product is called a difference of squares. To multiply conjugates, square the first term, square the last term, write it as a difference of squares. Multiply using the product of conjugates pattern: ⓐ \((2x+5)(2x−5)\) ⓑ \((5m−9n)(5m+9n)\). It is the product of conjugates. Square the first term, 2x.2x. Square the last term, 5.5. Simplify. The product is a difference of squares. Multiply: ⓐ \((6x+5)(6x−5)\) ⓑ \((4p−7q)(4p+7q)\). We just developed special product patterns for Binomial Squares and for the Product of Conjugates. The products look similar, so it is important to recognize when it is appropriate to use each of these patterns and to notice how they differ. Look at the two patterns together and note their similarities and differences. • Product is a trinomial • Product is a binomial. • Inner and outer terms with FOIL are the same. • Inner and outer terms with FOIL are opposites. • Middle term is double the product of the terms • There is no middle term. ⓐ \((2x−3)(2x+3)\) ⓑ \((5x−8)^2\) ⓒ \((6m+7)^2\) ⓓ \((5x−6)(6x+5)\). These are conjugates. They have the same first numbers, and the same last numbers, and one binomial is a sum and the other is a difference. It fits the Product of Conjugates pattern. We are asked to square a binomial. It fits the binomial squares pattern. Again, we will square a binomial so we use the binomial squares pattern. This product does not fit the patterns, so we will use FOIL. ⓐ \((9b−2)(2b+9)\) ⓑ \((9p−4)^2\) ⓒ \((7y+1)^2\) ⓓ \((4r−3)(4r+3)\). ⓐ \((6x+7)^2\) ⓑ \((3x−4)(3x+4)\) ⓒ \((2x−5)(5x−2)\) ⓓ \((6n−1)^2\). Just as polynomials can be multiplied, polynomial functions can also be multiplied. ⓑ In part ⓐ we found \((f·g)(x)\) and now are asked to find \((f·g)(2)\). Access this online resource for additional instruction and practice with multiplying polynomials. How to use the FOIL method to multiply two binomials. In the following exercises, multiply the monomials. In the following exercises, multiply. In the following exercises, multiply the binomials using ⓐ the Distributive Property; ⓑ the FOIL method; ⓒ the Vertical Method. In the following exercises, multiply the binomials. Use any method. In the following exercises, multiply using ⓐ the Distributive Property; ⓑ the Vertical Method. In the following exercises, multiply. Use either method. In the following exercises, square each binomial using the Binomial Squares Pattern. In the following exercises, multiply each pair of conjugates using the Product of Conjugates Pattern. In the following exercises, find each product. Which method do you prefer to use when multiplying two binomials: the Distributive Property or the FOIL method? Why? Which method do you prefer to use when multiplying a polynomial by a polynomial: the Distributive Property or the Vertical Method? Why? Explain the pattern that you see in your answers. Why does \((a+b)^2\) result in a trinomial, but (a−b)(a+b)(a−b)(a+b) result in a binomial? ⓑ What does this checklist tell you about your mastery of this section? What steps will you take to improve? A conjugate pair is two binomials of the form (a−b),(a+b).(a−b),(a+b). The pair of binomials each have the same first term and the same last term, but one binomial is a sum and the other is a difference.